Is Hospice Only for Cancer Patients? When Susan’s mother was terminally ill, her doctors recommended hospice care. It would help keep her mom comfortable, they explained, and even improve her quality of life. 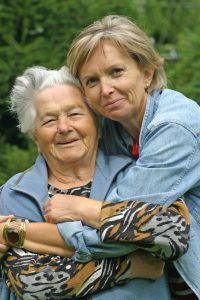 Hospice would provide a team of caregivers to meet Mom’s needs, helping her to stay at home rather than in the hospital. But Susan still had questions to ask about hospice. How would she pick the right hospice organization? One that would provide the best possible care for her mother… one she could trust… one that would truly be there for Mom? Those are important questions, and more people are starting to ask them as awareness of hospice grows. Today, many families are learning that hospice care can ease suffering and increase comfort toward the end of life, for both patients and their loved ones. This article will tell you what to look for when choosing a hospice provider. But first, it’s helpful to understand what hospice is and what it does. Hospice is a philosophy of care, rather than a place. It focuses on comfort, instead of seeking a cure. Hospice care neither hastens nor postpones death. It provides personalized services by a caring team that responds to the individual needs of each patient and their loved ones. The hospice team provides medical, emotional, and spiritual support for both patient and family. This team includes a physician, nurse, social worker, home health aide, pastoral care counselor, and volunteers. Got Questions about hospice and palliative care? Get answers now. 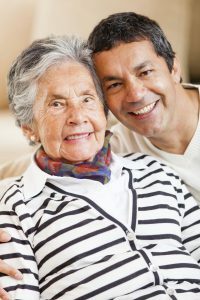 Most hospice care is provided in a patient’s home, assisted living facility or nursing home, but can also be provided in a hospital or inpatient hospice facility. The patient’s home-centered care allows families more involvement in their loved one’s care, more opportunities to make decisions, and greater time to spend together in comfortable surroundings. 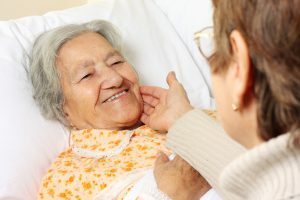 An estimated 1.7 million people received hospice services in 2014 — a 20 percent jump from 2010, according to the National Hospice and Palliative Care Organization (NHPCO). The number of hospice organizations is rising, too – from 4,850 in 2008 to more than 5,500 today. However, not all hospices provide the same level of care, and differences between hospice providers can be significant. So how can patients and families know which hospice to choose and when to start services? What questions should you ask about hospice? Below are guidelines for what to look for and what questions to ask when seeking a hospice provider for yourself or a loved one. Medicare, and recent reports have revealed problems at some of those programs. Consider the hospice’s primary mission, which will be affected by its for-profit or not-for-profit status. Twenty or more years of experience. Hospice-certified nurses and doctors on staff and available 24/7. Palliative-care (comfort care) consultants who can alleviate symptoms, even if the person isn’t ready for hospice yet. An inpatient unit, where patients can stay if symptoms can’t be managed at home. Such facilities should provide home-like care. Ability to provide care in nursing homes and assisted living residences. Medicare approval. This enables Medicare (or Medicaid) to pay for services, including equipment and home health aides as needed, plus counseling and grief support for the patient and family. Most hospices are certified by Medicare and are therefore required to follow Medicare rules and regulations. Has the hospice been surveyed by a state or federal oversight agency in the last five years? Ask when the last survey occurred and if any deficiencies were noted and, if so, have they been resolved. Is the hospice accredited by a national organization? Several organizations accredit hospices, surveying them to ensure they meet quality standards. The Joint Commission on Accreditation of Healthcare Organizations (JCAHO), for instance, is one such “gold standard” accrediting agency. Hospices are not required to be accredited, but accreditation can reflect the hospice’s commitment to quality. Is the hospice licensed by the State? Are all the costs of hospice care covered by the patient’s health insurance? What services will the patient have to pay for out-of-pocket? Are any services provided at no charge? Does the hospice conduct a family evaluation survey? Many hospices ask family members to complete a brief evaluation of their services after the death of a loved one. Ask for their most recent scores so you can see how previous patients and family members have rated their services. What services do the hospice’s volunteers provide, and how quickly will a volunteer be available if requested? How does the hospice match volunteers to patients/families? Volunteers can offer companionship, light household chores, running errands, and the like. What screening and training do hospice volunteers receive before they are placed with patients and families? All volunteers must receive training or orientation on hospice care. Will staff come to the home if there is a crisis at any time of day, night and on weekends? How quickly does the hospice respond to after-hours emergencies? Who is available to make the home visit (nurses, doctors, social workers, chaplains)? Hospice staff are available by phone 24/7. However, some hospices offer limited in-home support on nights and weekends, while others will send staff to a patient’s home at any time when a crisis arises. A nurse is often the ideal person to visit during a medical crisis; however, sometimes the crisis is best handled by a physician, social worker, chaplain or other provider. Ask if all hospice team members are available in a crisis, at any time. If I need to go to a hospital or nursing home, which ones does (or doesn’t) the hospice work with? If you have a preferred hospital or know you may need to go to a nursing home, find out which ones the hospice has contracts with so they can continue to provide your hospice services in this different setting. What “extra” services does the hospice offer? All hospices provide medical, emotional and spiritual care, medicines, medical supplies and equipment, volunteers and grief support after the death of a loved one. Some hospices also offer specialized programs for children or people with specific diseases, “pre-hospice” care for people who may still be seeking curative treatment or who are not yet medically ready for hospice care, and other services that may benefit your family. Samaritan, for instance, offers a Catholic hospice program, a Jewish hospice program, and a program for military veterans. We also provide “complementary” therapies such as massage therapy, music therapy, pet therapy and aroma therapy, which bring a variety of benefits. How quickly can someone be admitted to the program, and can admission occur at night or on weekends? If you are referred to hospice late in the day or on the weekend, a hospice’s ability to start services quickly might be very important. Is the hospice a “We Honor Veterans” partner? Such hospices have demonstrated their commitment to improving the care they provide to military veterans and their family members. Management: Who manages the hospice? It is locally based or headquartered in another state? Base of Operation: Does its service area include your community of residence? Access: Does the hospice actively reach out to all segments of the community? What is its stance toward patients who cannot pay for services? Responsiveness/Flexibility: How quickly will the hospice respond to your first inquiry? Is it flexible in creating a plan of care best suited to your family’s needs? How does the hospice staff, working with the patient and loved ones, honor the patient’s wishes? What services are provided after-hours and on weekends? Staff Expertise and Training: Does the hospice employ a full-time medical director and staff with specialized training in hospice and palliative (comfort) care? What kind of supervision and ongoing training does its staff receive? Family Involvement and Support: Are family caregivers given the information and training they need to care for the patient at home? Is respite care (relief for the caregiver), including inpatient-level for acute symptom management, available? Are loved ones told what to expect in the dying process and what happens after the patient’s death? 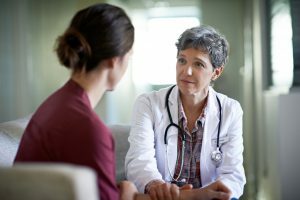 Physician Role: What is the role of the patient’s physician once hospice care begins? How will the hospice physician oversee the patient’s care and work with the patient’s doctor? Comfort and Pain Management: Does the hospice staff regularly discuss and routinely evaluate pain control and symptom management with patients and families? Does the hospice staff respond immediately to requests for additional pain medication? How does the hospice meet the spiritual and emotional needs of the patient and family? 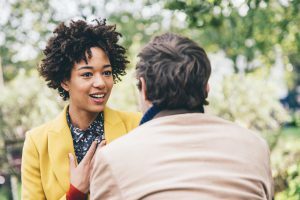 Bereavement Support: How extensive is the organization’s grief support program for family caregivers before and after a loved one’s death? References: Does the hospice have a reputation for delivering what it promises? Seek references or ask those who have used its services to find out – including their experiences during the daytime, evening and on weekends. Accordingly, it’s best to start your hospice search early – before the stressful time when your family needs hospice services. Finding the right organization is well worth the effort. Good hospice care can provide pain relief, comfort, peace and support during the most difficult times, for patients as well as their families. So be sure to do your homework when choosing a hospice. Ask your friends and colleagues for recommendations, read articles, and compare qualities. If you have any questions, Samaritan is an experienced hospice in South Jersey. Contact us by phone at (800) 229-8183 or email us at info@SamaritanNJ.org. End-Stage Dementia: How Long Does it Last and When is Hospice Called In?